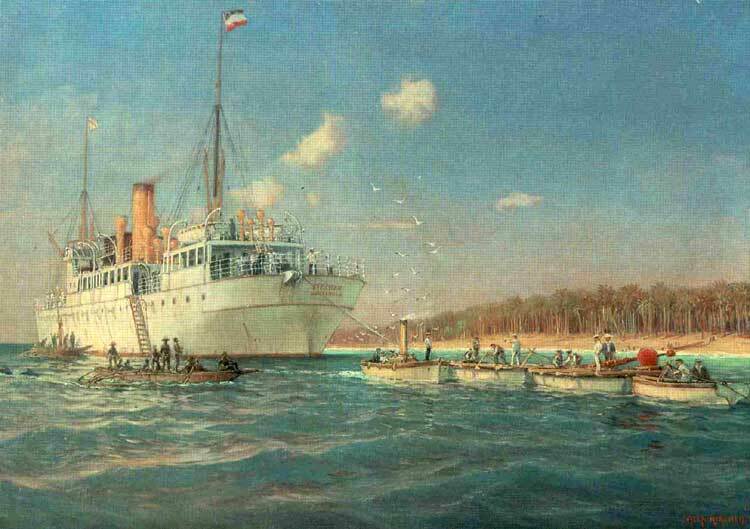 CS Stephan off the New Guinea coast, laying the Dutch East Indies – Yap – Guam cable, c.1906. Image available in the public domain via Atlantic-cable.com. Located in the western Pacific Ocean and forming part of the Caroline Islands, Yap Island was a major German naval communications centre in the early twentieth century up to World War One and was an important international hub for cable telegraphy. Map of Yap Island, courtesy of Missing Air Crew Project: the search for the Coleman B-24 Crew. From the seventeenth century up to 1899, Yap Island was a Spanish colony within the Captaincy General of the Philippines. After the defeat against the US in 1898 and subsequent loss of the Philippines, Spain sold these islands and its other minor Pacific possessions to Germany. In the early twentieth century, the Deutsch-Niederlandische Telegraphen-gesellschaft (German-Netherlands Telegraph Company, sometimes translated as German-Dutch Telegraph Company) was established with the remit to link the German Pacific Colonies into the main submarine telegraph networks. As part of this, in 1906 the company laid telegraph cables from Menado, Dutch East Indies to Yap Island and to Guam. At Yap Island, a spur was run into Shanghai. Yap Island formed part of the Menado-Yap-Guam-Shanghai undersea cable route and this route meant that Germany was no longer reliant on British-controlled (“All Red”) telegraph cables in the Pacific. 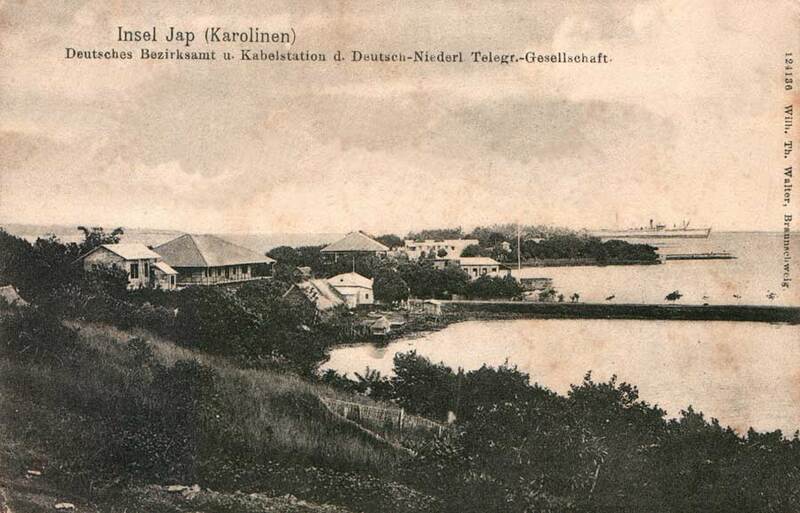 German-Netherlands Telegraph Company District Office and Cable Station, Yap. CS Stephan is at centre right. Dated 2 July 1908, the card was sent to a member of the staff of the German Atlantic Telegraph Company Cable Station at Vigo, Spain. Image available in the public domain via Atlantic-Cable.com. Between 1906 and 1914, Yap became a major German naval communications centre and was an important international hub for cable telegraphy as it offered one of the two key alternative routes to the US-controlled Commercial Pacific cable. 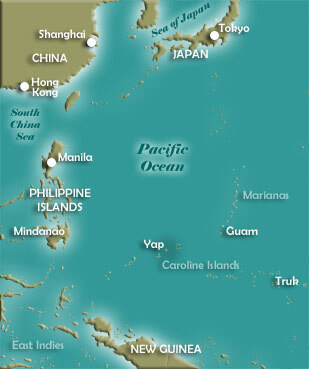 Yap Island formed a key node in the German telegraph cable line which also included Guam, Shanghai, the Dutch East Indies, and the Philippines. Some telegraph messages sent to the German South Sea domain were delivered on from Yap by ship and, after the construction of a wireless station around 1910, by wireless. Around 1910, the German South Sea Radio Company (a subsidiary company of the German-Netherlands Telegraph Company) established a wireless station on Yap Island to provide wireless communication where a telegraph cable would have been costly and difficult to lay: to Rabaul in New Guinea and to Nauru. The station, issued the callsign KJA, had a range of 300-500 miles and was commercially operated. Upon the outbreak of war in early August 1914, Yap Island as well as its telegraph station came under the mandate of Japan. The wireless station was destroyed by British naval cruisers shortly after war broke out on 12 August 1914 and the Japanese shut down the telegraph station for the duration of the conflict. The Japanese mandate continued for a short period after the end of the war and this was confirmed by the Treaty of Versailles in 1919. However, this tiny island in the middle of the Pacific was of immense strategic importance in the overall global telegraph cable network and was one of only two alternative routes to the US-controlled Commercial Pacific cable from Manila to San Francisco; the other alternative route passed through Japan. The US was deeply concerned about control of the Pacific Ocean and competition with Japan, both in terms of shipping lanes as well as the telegraph cable network. As a result, the US objected to Japanese control over the island. This was eventually rectified by an agreement signed in December 1921 and which came into effect in 1922 which recognised the Japanese mandate over the island of Yap but gave the US equal access to the island and shared control, management, and operation with the Japanese of the telegraph station and the cable from Yap to Guam. The Japanese fortified the island and continued to control the island until it was occupied by the US towards the end of World War Two. Jetty & buildings on Yap Islands, probably dating from German colonial period. With narrow-gauge tramway tracks running down the jetty. Image available in the public domain via Spontoon Island: Pacific Island Architecture. Wrinkler, Jonathan Reed. Nexus: Strategic Communications and American Security in World War I (2008). Memorandum on Cable Communications in the Pacific. Memorandum (Institute of Pacific Relations, American Council) , Vol. 1, No. 16 (Sep. 1, 1932), pp. 1-3. Knoll, Arthur J. and Hermann J. Hiery (eds). The German Colonial Experience: Select Documents on German Rule in Africa, China, and the Pacific 1884-1914 (2010). Department of the Navy and the Bureau of Steam Engineering. Wireless Telegraph Stations of the World including shore stations, merchant vessels, revenue cutters, and vessels of the US Navy, updated to 1 January 1912 (1912). This entry was posted in Military, Telegraph and tagged cable telegraphy, caroline islands, Germany, Japan, yap island on 3 April 2014 by Elizabeth Bruton.